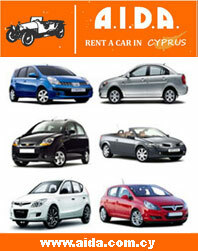 We are an establish Paphos car rental company with a huge selection of new cars ranging from economy to luxury. Discounted, all inclusive rates are available for our online customers with free delivery to Paphos airport no matter what time you arrive. We can also arrange delivery and collection anywhere in Southern Cyprus, including Larnaca airport. We offer an all inclusive rental price - no surprises on arrival - and you will find our cars clean and well maintained. Baby and child seats are free - all we need is notice.